Aktau (Kazakh: Ақтау, translit. 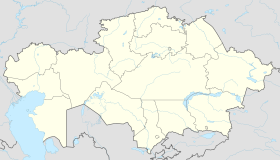 Aqtaý; Russian: Актау) is a city in Kazakhstan, located on the east bank of the Caspian Sea. Its current name means "white mountain" in Kazakh, which may be due to its cliffs that overlook the Caspian. From 1964 to 1991 city was known as Shevchenko (Russian: Шевченко). Its former name was given due to the eponymous Ukrainian poet's period of exile in the area. It is located on the Mangyshlak Peninsula and is the capital of Mangystau Region. Aktau is known for its unique block address system. Almost no streets in Aktau have names; instead, addresses generally consist of three numbers: the district number (also known as micro-region/micro-district/block), the building number, and the apartment number. This is because Aktau was originally planned as a camp for the workers of the oil industry. The territory of what is now Aktau was once inhabited by ancient tribes of Scythians. Archeological finds in the area include old settlements and utensils. The current territory of Mangystau hosted a spur route of the northern silk road, which resulted in the founding of several Sufi shrines in Aktau's vicinity. However, the area had very little population prior to Soviet times and no cities of any relevancy, almost certainly due to the scarcity of fresh water. In 1958, uranium prospectors settled the site of modern Aktau, naming the settlement Melovoye (Меловое) after the bay on which it stood. After the development of the uranium deposits was started, the settlement was closed and renamed Guryev-20 (Гурьев-20). In 1963, its closed status was lifted, town status was granted, and the name was changed to Aktau. However, in 1964 it was given yet another name, Shevchenko (Шевченко), to honor the Ukrainian poet Taras Shevchenko who spent 1850–1857 in political exile in Novopetrovskoye, about 100 kilometers (62 mi) to the northwest. This Ukrainian name for the city may have been granted due to the large number of Ukrainian workers who settled in the city. Their descendants are easily identifiable to this day by surnames ending in '-enko'. After the dissolution of the Soviet Union and Kazakhstan gaining independence, the name Aktau was restored in 1991, but the city's airport still retains SCO as its IATA code. Aktau was once the site of a nuclear power station. The BN-350 FBR went online in 1973, and closed in 1999. In addition to producing plutonium, BN-350 was also used to provide power and for desalination to supply fresh water to the city. The long-term plans of the Government of Kazakhstan include the construction of a new nuclear power station to be built near the current one. The current station is not considered powerful enough to supply the fresh water and energy needed at this time, and blackouts are a common occurrence. Aktau has an international airport, a railway station, and a developed seaport. Buses and taxis are the principal means of public transport within the city. Kazakhstan has been increasing the importance of Aktau's port with its changes in international export policy. It has been attempting to halt the transit of grain through the Black Sea and instead use routes over the Caspian or via Turkmenistan. Aktau's port has been expanded (completion achieved summer 2015) to accommodate ever larger quantities and more diverse types of cargo. The intent is for cargo to transit by ship over the Caspian Sea and then by rail through Azerbaijan and Georgia for delivery in Turkey and beyond. This new route was made possible by the opening of a railway connecting Georgia and Turkey in 2014. Aktau experiences a cold desert climate (Köppen BWk), with warm to hot dry summers and cold winters, with a mean January temperature of −0.5 °C (31.1 °F), and a mean July temperature of +25.55 °C (77.99 °F). It is notable that most of the city of Aktau lies below sea level in the Caspian Depression and is proximate to the lowest point in Kazakhstan and the former Soviet Union at Karagiye. The beach season lasts from May to September, with an average sea temperature of +21 °C (70 °F). Aktau has both rocky hills and sandy beaches along the seashore. There are several modern resorts on the coast to the south of the city. The beaches of the Caspian shore are popular in the summer, due to the hot climate of the season. Tourists come mainly from other parts of Kazakhstan. The city has a variety of local hotels and western chains of Renaissance and Holiday Inn. A ceremony to open the capsule was arranged and people traveled from far and wide to attend. This was subsequently postponed and then cancelled when it become known that capsule was, in fact, missing. Previously the capsule had been buried in another part of the town but building works in that location caused it to be relocated to the District 2 location. Sadly the capsule didn't make the move. An official from the time of the creation of the capsule who had been involved in the drafting of a message to be included within the capsule was able to remember word for word the message that was written which by all accounts contained a theme of hope for the future. On September 11, 2007, President Nursultan Nazarbayev started the Aktau city project in order to develop tourism and attract investment. A totally new city was to have been built to the north-west of the current city with 4 million square meters of new residential and business buildings. The architecture style would have been derived from UAE's construction experience under the patronage of Sheikh Abdullah ibn Zaid Al Nahayan. In August 2013, the project was called off. ^ "Results Of The 2009 National Population Census Of The Republic Of Kazakhstan Analytical Report" (PDF). The Agency On Statistics Of The Republic of Kazakhstan. ^ "Aktau city, Kazakhstan facts, history, attractions, photos". About Kazakhstan. Retrieved 2015-12-29. ^ a b "Aktau: Years, people, memories". Ogni. October 13, 2011. ^ a b Пионеры Запада (in Russian). Np.kz. February 28, 2003. Retrieved January 23, 2015. ^ "Securing the Bomb: Securing Nuclear Warheads and Materials: BN-350 Spent Fuel Security". 8 March 2008. Archived from the original on 8 March 2008. Retrieved 14 November 2018. ^ "Aktau Port". Port Aktau. Archived from the original on June 7, 2013. Retrieved May 29, 2013. ^ "Expansion of Aktau seaport goes according to schedule: Kazakhstan Temir Zholy". Tengri News. 2015-06-25. Retrieved 2015-12-29. ^ "Kazakhstan to Leave Black Sea Grain Route". The Gazette of Central Asia. Satrapia. August 8, 2012. Retrieved 8 August 2012. ^ "Svali.ru" (in Russian). Retrieved May 7, 2012. ^ "Tenaris to build new facility". Tenaris. July 9, 2014. ^ "Ambitious Aktau-City project scrapped". Ақ Жайық (in Russian). Retrieved 14 November 2018. ^ Lada.KZ. "Айдарбаев: Актау-сити не будет". lada.kz. Retrieved April 19, 2018. Wikimedia Commons has media related to Aktau. This page was last edited on 17 April 2019, at 20:40 (UTC).